This article is 2531 days old. The University of Windsor has launched three mobile apps to help students and community members find out about campus information, check their grades, read the daily news, find out the soup du jour at food locations and even listen to a live stream of CJAM 99.1. The new apps were released for iPhone, BlackBerry and Android on Thursday morning as part of Campus Technology Day. 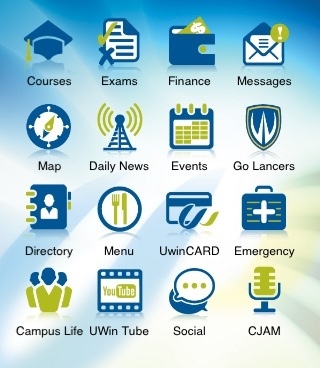 The myUWindsor apps provide handheld access to all services and information students would typically access on the University’s home page, through the student portal and the Collaboration and Learning Environment Windsor (CLEW) learning management system.